Our Custom Post It Notes are the perfect stationery item that will last long and spread the word of your company brandname and logo to many other potential customers. Did you know the post it note was the result of a failed experiment to make the worlds strongest adhesive? ......And the colour yellow was simply used for coincidence - as the laboratory next door used scrap yellow paper! Dr.Spencer Silver came up with the idea of a low tack reusable glue, but it wasn't until a colleague of his, Art Fry whom invented the post-it note - conceived the idea to stick a book mark to his 'hymnbook' - was the idea of the post-it note truly born. Customisable for displaying a litho print of your company logo and brandname, you can ensure maximum exposure when sat on the customers desk along with other stationery items such as pens , staplers and rulers. 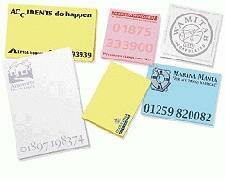 Why not have these Promotional Post It on your customers desks?